TrickBot is up to its tricks again. Once cyber experts get a handle on it, TrickBot releases new modules that advance its capabilities. Here’s what you need to know to protect your organization from TrickBot. The Multi-State Information Sharing and Analysis Center (MS-ISAC) recently released a security primer on TrickBot. Originally developed in 2016 as a Windows-based banking Trojan, TrickBot has recently advanced its capabilities. Malware developers are continuously releasing new modules and versions of TrickBot— And they’ve done this once again. TrickBot is disseminated via malspam campaigns. Malspam is a combination of malware and spam. It’s usually delivered through phishing or spear-phishing emails. Its goal is to exploit computers for financial gain. These malspam campaigns send unsolicited emails that direct users to download malware from malicious websites or trick the user into opening malware through an attachment. The developers behind TrickBot have continue to add more features via modules to this potent trojan virus. It can download new modules that allow it to evolve if left unchecked. How Does The TrickBot Malspam Campaign Work? The malspam campaigns that deliver TrickBot use third-party branding looks familiar to you and your staff such as invoices from accounting and financial firms. The emails typically include an attachment, such as a Microsoft Word or Excel document. If you open the attachment, it will execute and run a script to download the TrickBot malware. And, TrickBot is really tricky. It runs checks to ensure that it isn’t put in a sandboxed (quarantined) environment. Then it attempts to disable your antivirus programs like Microsoft’s Windows Defender. And even worse, TrickBot redeploys itself in the “%AppData%” folder and creates a scheduled task that provides persistence. Persistence is the continuance of the effect after its cause is removed. So, even after you remove TrickBot, it can still create problems. What Happens If Your Network Gets Infected With TrickBot? TrickBot’s modules steal banking information, perform system/network reconnaissance, harvest credentials and can propagate throughout your network. Will harvest your system information so that the attacker knows what’s running on your network. Compares all files on your disk against a list of file extensions. Collects more system information and maps out your network. Harvests browser data such as cookies and browser configurations. Steals credentials and configuration data from domain controllers. Auto fills data, history, and other information from browsers as well as software applications. Accesses saved Microsoft Outlook credentials by querying several registry keys. Force-enables authentication and scrapes credentials. Uses these credentials to spread TrickBot laterally across your networks. 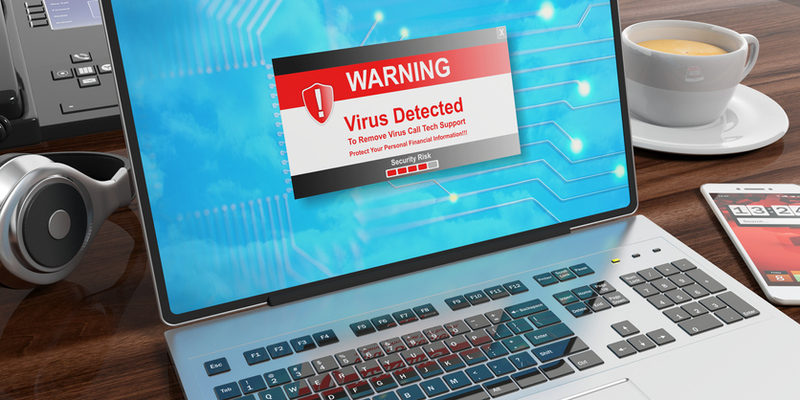 In November 2018, a module was developed and added that gave TrickBot the ability to steal credentials from popular applications such as Filezilla, Microsoft Outlook, and WinSCP. In January 2019, three new applications were targeted for credential grabbing: VNC, Putty, and RDP. In addition, it can also steal credentials and artifacts from multiple web browsers (Google Chrome/Mozilla Firefox/Internet Explorer/Microsoft Edge) including your browsing history, cookies, autofills, and HTTP Posts. How Can You Protect Your Organization From TrickBot? Implement filters at the email gateway to filter out emails with known malspam indicators such as known malicious subject lines, and block suspicious IP addresses at the firewall. Use managed antivirus programs on clients and servers, with automatic updates of signatures and software. Off-the-shelf antivirus isn’t enough. Arrange for vulnerability scans to detect TrickBot or other malware threats that are hiding in your IT systems. Apply appropriate patches and updates immediately after they are released. Provide Security Awareness Training for your users. Regular training will ensure that they can recognize social engineering/phishing attempts, and refrain from opening attachments from unverified senders. Help you employ a Password Management solution so your usernames and passwords aren’t disclosed to unsolicited requests. Deploy a managed Anti-Spam/Malware Solution with the latest signature and detection rules. Review security logs for indicators of TrickBot. If any are found, we can isolate the host and begin investigation and remediation procedures. Make sure you adhere to the principle of least privilege, ensuring that users have the minimum level of access required to accomplish their duties. We’ll also limit administrative credentials to designated administrators. Implement Domain-Based Message Authentication, Reporting & Conformance (DMARC). This is a validation system that minimizes spam emails by detecting email spoofing using Domain Name System (DNS) records and digital signatures. If you don’t have a policy regarding suspicious emails, we can help you create one and specify that all suspicious emails should be reported to security and/or IT departments. Don’t let TrickBot use its tricks to steal your confidential data. Contact us for comprehensive IT Security Analysis and Remediation to keep TrickBot out of your network. What Should You Know About Cyber Security Today? Communication Concepts is a compact cyber security and IT consulting provider. Our goal is to come alongside your organization and ensure that technology is assisting your success, not inhibiting it. As a member of our insider’s community, you’ll receive front of the line intelligence on technology for businesses in the Kansas City metro area. © 2019 Communication Concepts, Inc. All rights reserved.